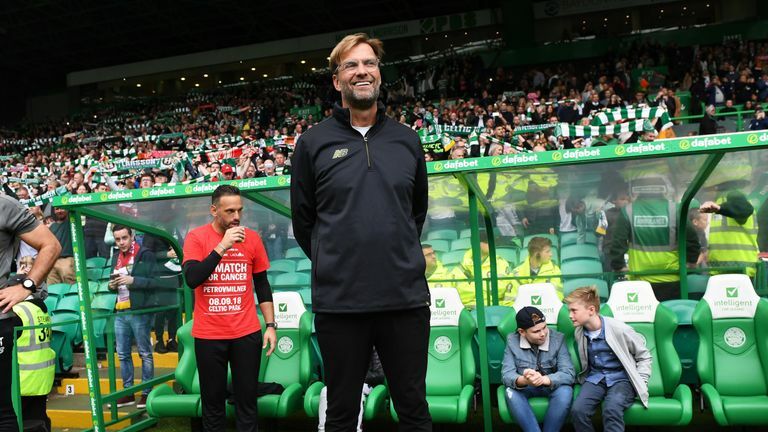 Jurgen Klopp gave a hilarious team-talk to the Liverpool side taking part in the Match for Cancer at Celtic Park on Saturday. The Reds boss was addressing a squad that included the likes of Jamie Redknapp, Dirk Kuyt and Luis Garcia. In a speech which is sure to be just a little different from his regular team-talks, Klopp told his players he 'did not care' how long they played for. However, the manager did tell former Liverpool midfielder and current Sky Sports pundit Redknapp he had to play for 120 minutes. When he had finished speaking, Klopp was given a round of applause by his players; to which he responded: "Wow, that's the first time that's happened!" The match between Liverpool and Celtic XIs - which finished 3-3 - was in aid of the James Milner Foundation, the Celtic FC Foundation and the Stiliyan Petrov Foundation. You can watch Jurgen Klopp's hilarious team-talk in the video above.